1. Heat a griddle pan over a high heat. Brush the aubergine slices with 2 tbsp oil, season and griddle in batches for 2 - 3 minutes on each side until tender. 2. For the dressing, blitz together the remaining oil with the basil, vinegar, mustard and 1 tbsp water in the small bowl of a food processor - it doesn’t need to be completely smooth. 3. 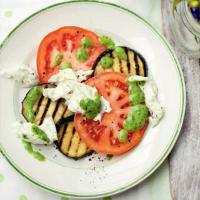 Arrange the aubergine slices on a plate with the tomato. Tear the mozzarella into pieces and scatter over the top. Drizzle with the dressing and grind over some black pepper.